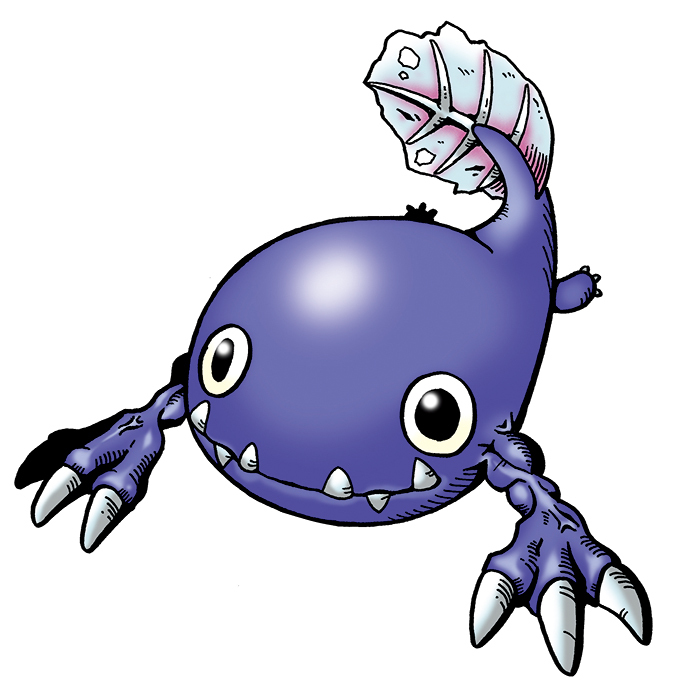 A larva Digimon whose skin has not yet fully hardened because it chose to live underwater. It swims in lakes and rivers upstream of the Net Ocean with its large tail, and occasionally climbs up onto rocks with its developed forelimbs and does vocal training. Its mostly undeveloped hindlimbs act as rudders in place of its tail, which has gained propulsive power, contrary to typical organisms. It is valuable among Child levels in that it signals its upcoming evolution clearly, but since its potential for mutation is extremely high, caution is necessary in its training. Its Special Move is sending the opponent into an eternal slumber (Lullaby Bubble). A larva Digimon whose skin has not yet fully hardened because it chose to live underwater. 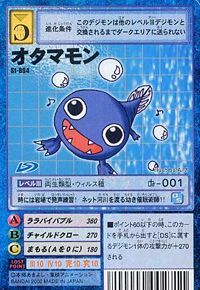 It swims in lakes and rivers upstream of the Net Ocean with its large tail. It occasionally climbs up onto rocks and does vocal training. Its appearance makes you predict its next evolution, but because its potential for mutation is extremely high, caution is necessary in its training. Its Special Move is sending the opponent into an eternal slumber (Lullaby Bubble). An Amphibian Digimon. Its Special Move is inducing sleep (Lullaby Bubble). — Digimon Adventure: "The Sleeping Tyrant! 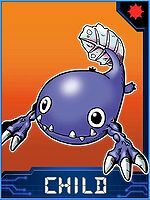 Tonosama Gekomon"
Amphibian type Digimon, Child level. — Digimon Tamers: "The Mystery of Guilmon's Birth! 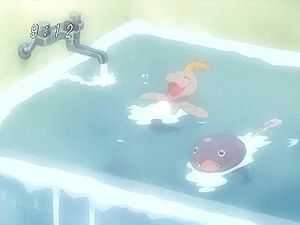 The Mystical Water Space"
n., Short for otamajakushi 「お玉杓子（オタマジャクシ）」, which means tadpole. Anime/Manga Digimon Adventure: "The Sleeping Tyrant! 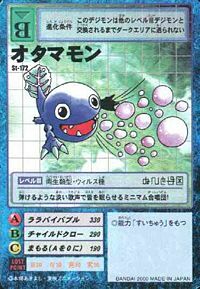 Tonosama Gekomon"
ララバイバブル Rarabai Baburu Stun Bubble/Lullaby Bubble Spits out a stream of bubbles that can put opponents to sleep. チャイルドクロー Chairudo Kurō Kid Claw Scratches at the foe with its claws. Encases itself in a protective bubble and causes a ball of water to drop on the enemy from the sky. Attacks by shooting a stream of water from its mouth. Tai Atari  Body Blow たいあたり N/A Slamming Attack/Tackle Tackles the enemy headfirst. Otamamon were among the servants of Tonosama Gekomon that pampered Tachikawa Mimi to try and convince her to wake up their master. Some Otamamon were under the care of Hangyomon. 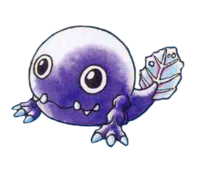 An Otamamon is among the baby Digimon that Piyomon was caring for that ends blown to the human world by a tornado. They all end up in the care of the Sayuri and Chika in the Daimon household. 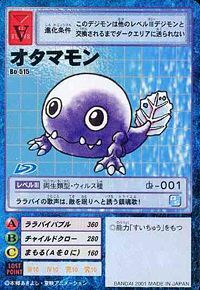 Otamamon is an obtainable Digimon. 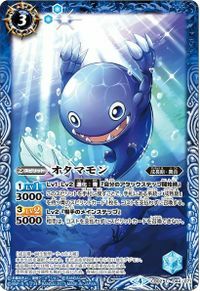 Can evolve to Gekomon (0-2 DP) or Octmon (3+ DP). 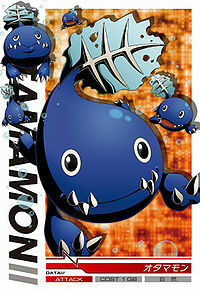 Otamamon is one of the balloons in the Twisted Toy Town stage. Can be found at Sewage Tunnel. It can evolve to Gekomon if above level 18, or Raremon if above level 18 and Machine EXP above 200. Otamamon is an obtainable evolution of Agumon. Evolves from Mochimon. Can evolve to Tortamon, Starmon, Kuwagamon or Gekomon. Evolves from Mochimon. Can evolve to Tailmon, Starmon, Kuwagamon or Gekomon. Evolves from Frimon. Can evolve to Blade Kuwagamon, Coelamon, Greymon X-Antibody, or Revolmon. Evolves from Mochimon and can evolve to Gekomon, Kuwagamon or Tailmon. It plays a mysterious melody! The Minimum Choir will put you to sleep with their faint voices! It is sometimes found practicing its vocals among the rocks! A young hypnotist who traverses the Net's rivers!! Its lullaby-like singing voice is a requiem that invites its enemies to sleep! 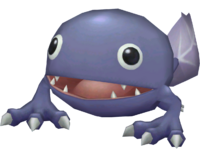 A larval Digimon that uses its large tail and developed forelimbs to climb onto rocks, where it does its choral practice. 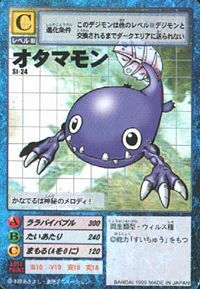 Although it typically grows to become an Aquatic-type Digimon, there are cases of it mutating as well. A larva Digimon whose skin has not yet fully hardened because it chose to live underwater. It is valuable among Child levels in that it signals its upcoming evolution clearly, but since its potential for mutation is extremely high, caution is necessary in its training. ↑ Digimon Savers: "Strong Justice! The Beast Knight Duftmon"